Every once in a while one finds themselves going out to an area, that is off the beaten track and that is what happened the other day. Since we were going to be in Trenton, Michigan a good friend of ours was called and we arranged to have dinner with her. We anticipated that we should suggest one restaurant and she suggested another, and the funny thing is that it was the same a restaurant another friend of mine had suggested if we ever get down to Trenton, so off we went. Now I have to tell you, that our friend is a dear friend of my Bride, in fact, right after I had met my Bride, her friend called me and gave me a “Third Degree” interrogation over the phone to make sure that my intentions were honorable, not to mention that my Bride and her friend meet other former co-workers once a month for dinner just to keep in touch. The funny thing is that after we had ordered a couple were seated at the table next to us, and I heard my name uttered, and it was a vendor that I used to deal with when I was a buyer, who was out with his wife for dinner, and I would venture that we were both surprised to run into each other, even though I knew that he lived close by the restaurant. My Bride started telling her friend that this happens often, because I have met so many people through the years, and she related a couple of other incidents where this had happened, once even in Napa Valley. 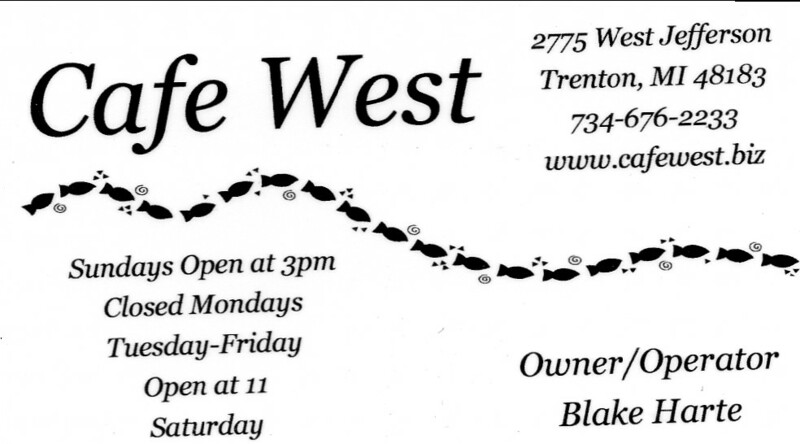 We arrived at Café West early, but that did not keep us from going in and studying the menu and the wine list. My Bride decided that she was going to try a Key Lime Martini, because it sounded interesting, I decided to forgo a cocktail as I had to do some studying for our selections. We ordered a couple of appetizers so we could all share some of the dishes; we ordered Duck Egg Rolls and an order of Escargot and Crevettes to get started and by then the conversation was flowing. For dinner our friend ordered Chicken Marsala, my Bride ordered Crab Cakes and I went with the Seafood Mac and Cheese which came with Scallops and Jumbo Shrimp (which were true for a change, even if it is an oxymoron). We finished the meal by sharing one order of dessert, a plate of chocolate tubes filled with Bailey’s Irish Crème and chocolate cream filling the two ends of the tubes. While the ladies were breaking up the tubes to eat, I just took one of the tubes and dropped right into my cup of coffee and made my own after dinner concoction. Since we were all having lighter meals, I decided to go with a white wine, even though I did have a duck dish as an appetizer. My first choice and only because I thought it sounded interesting was a Chardonnay from Spain, but alas they were out of that wine, and our waiter brought over two other Chardonnay wines to choose from, and one of the wines we had already tried, so I opted for a new wine. Half of the fun of writing this Blog is for the chance to try some wines that are new, it would be oh so boring to keep writing about the same wines over and over, even though it seems that I do, perhaps because both my Bride and I can be creatures of habit. 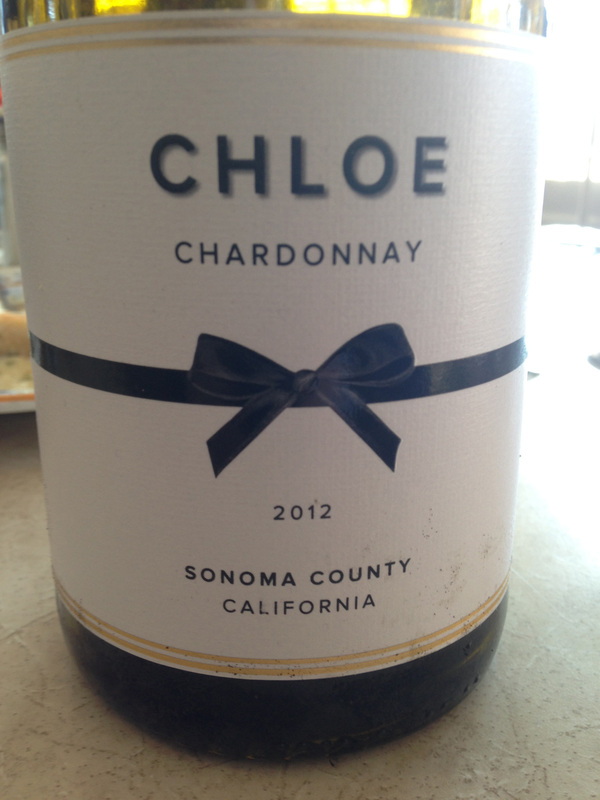 I selected a bottle of Chloe Chardonnay 2012 from the Sonoma County in California. A lot of people would groan at a bottle of Chardonnay, but I like to try them, even though they can be a hit or a miss. I thought that this wine was a hit, as it was not overly buttery, as half of it is aged in stainless and the other half in oak and then blended together. There was enough acidity to be pleasant with all of the dishes and a great compliment to the evening. I may have passed on this wine in a wine shop, but in a restaurant, one can find a wine at times that surprises you, and we were happy with the choice. This entry was posted in Dining, Wine and tagged California, Chardonnay, Chloe Wines, Sonoma County. Bookmark the permalink.